Somehow today, finally, I had the chance to hear your melodious rendering of Janani ninnuvina on YouTube. Just beautiful. What meaning! Your slow pace combined with continual ups and downs must be really hard on the lungs, demanding rigorous practice. Reminded me of my mother's measured rendering of "mamava pattabhi rama" (believe it was in maNirangu) decades ago. My heart-felt 'koti namaskarams' to you and others such as yourself, for maintaining and propagating our ancient, Divine-art form. Thank you for your highly enjoyable and educational blog. It performs an important function of filling a void. Would you shed light on the following? 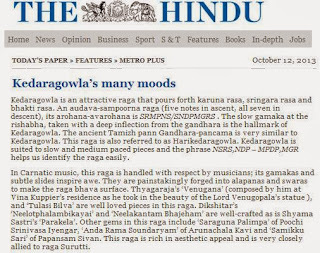 I happened to watch a video of an absorbing old song & dance "varugiraaL unnai thedi" - can't remember the raga but sounds like "madhura madhura veNu geetha mogha" but they are starting a wee bit late. .............Did you ever sing this song anywhere? Take your time as you might be extremely busy with the music season at Madras.